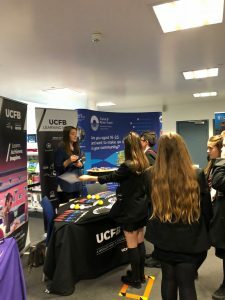 On Monday, the 24th of September, 45 year 10 students attended a Futures fair at Thomas Whitham Sixth Form College. At this event, they were given the opportunity to talk to a range of post 16 and higher education providers including the Universities from Liverpool, York, Leeds, Huddersfield, Edge Hill and Blackburn. Furthermore, there were also opportunities to talk to alternative options including Futures 2000 who offer apprenticeships and UCFB who specialise in degrees using a Football coaching model. To help support building personal statements for 6th Form Colleges, there were a range of volunteering options and the National Citizen Service who offer summer development courses. Students were given a presentation by the principal of Thomas Whitham, to support them in gaining the most information possible from the experience and they used the guidance to really grill the providers on their qualifications, funding options and facilities. The students were superb ambassadors for Unity College and thoroughly enjoyed the experience with many now making future steps in their careers.